See also: Durham Life Insurance Company; Jefferson-Pilot Corporation. With the Japanese attack on Pearl Harbor in December 1941 came a temporary freeze on radio station applications, which hampered smaller carriers. Through the 1940s, the airwaves were dominated by the four major broadcast networks:NBC, ABC, CBS, and the now-defunct Mutual Broadcasting System. In addition to war-related news, the networks provided a wealth of block programming-from serialized dramas to live performances. Comedy shows featuring Fred Allen, Jack Benny, George Burns, and Gracie Allen, along with dramas such as the Lux Radio Theater, Orson Welles's Mercury Theatre on the Air, and The Guiding Light, made radio the centerpiece of family entertainment. Kay Kyser joined the ranks of big band leaders like Benny Goodman, Glenn Miller, and Duke Ellington on nationally broadcast shows. Despite the networks' seeming monopoly of radio real estate, small stations still managed to spring up across North Carolina. Mount Airy's WPAQ, after its birth in 1948, began broadcasting live string band performances at 10,000 watts while also amassing a sizable catalog of traditional and folk music. In 1947 the North Carolina Association of Broadcasters was founded to provide support and information to state radio talent. Recognizable on-air personalities carved out reputations in the region. Greensboro native Edward R. Murrow moved on to a national audience, but local color ruled the state's airwaves. Commentators such as WBT's fiery, pulpit-tested J. S. Nathaniel Tross and WRAL's Fred Fletcher, known for his children's programming and traffic reports, were radio fixtures for years. Although by the 1950s television replaced radio as America's "everyday" medium, local radio fought the advance of network TV by filling spots on the airwaves normally overlooked by larger corporations, such as early morning time slots. For 30 years Grady Cole, beloved as "Mr. Dixie," was the voice of WBT's sunrise schedule, providing farm reports, community announcements, weather reports, and more into the early 1960s. Devotion to certain broadcasters induced listeners to continue tuning in, either for a chance of catching the "Voice of the Duke Blue Devils," announcer Lee Kirby, or the sweet sounds of Crackerjacks bandleader Arthur Smith. In addition to Grady Cole, WBT helped bring Charles H. Crutchfield, a station program director and the eventual president of Jefferson-Pilot Broadcasting, to prominence in the postwar years. 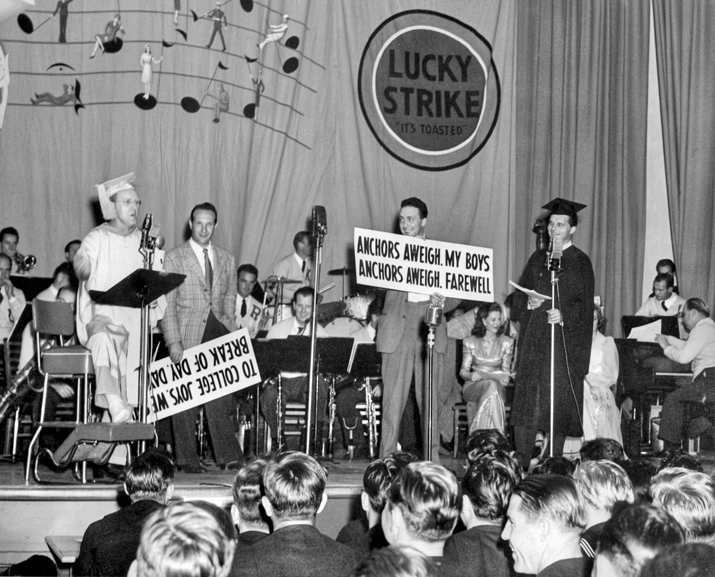 Kay Kyser and his band entertain U.S. Navy personnel during a live NBC radio broadcast of Kay Kyser's Kollege of Musical Knowledge, ca. 1943. North Carolina Collection, University of North Carolina at Chapel Hill Library. 1 January 2006 | McFee, Philip; Williams, Wiley J.
WBRM AM radio in Marion, NC went on the air in May 1949 and continues to broadcast today. Do you have any idea how this (years on air) compares to other current NC radio stations? Thank you. I have forwarded this to reference services at the NC Government & Heritage Library. A librarian will contact you shortly to help with your question.